greens, originally uploaded by notthewest. Someone in the Greens has a sense of humour. 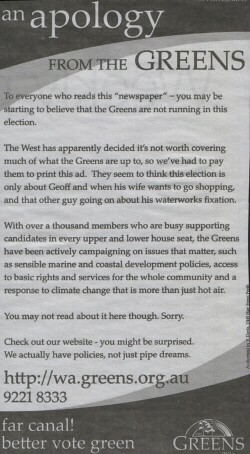 Their slogan for the WA election: far canal – better vote greens. Not bad. Here’s my review of the ad. First the easy stuff. The ad is a visual dud. I missed it the first time I read the paper. The name GREENS is a big positive and I would use it prominently in all press. Standardise the typeface. The logo is awful and reproduces poorly. Get professional! Second, the message. It’s a grizzle about the lack of coverage in the major daily. They seem to have made the normal error of talking about the enemy. Third, the strategy. If you read the copy of the ad you’ll notice it’s not corporate; it’s not written by a committee and this is a great strength. They should make this a defining characteristic of all their communication. For mine they could lose a bit of the smarty-pants tone. Nobody likes a smarty-pants do-gooder with a university degree. The message the Greens have not got across is that they stand for a scientific approach to decision-making that takes into account ALL the angles, not just big business. I’m thinkin’ this would be a good line for them. The other thing they must address is the phenomenon of people wanting to vote for a winner. They should be saying to the population; don’t vote to win, vote to influence. Increasing our percentage of the vote will put pressure on the government. The Greens should aim to present themselves as scientific, objective, straight-talking and interested in better outcomes for the community as a whole. I’d be saying “not just business, not just unions, communities”.